The Graduate School of Arts and Sciences Centennial Medal, first awarded in 1989 on the occasion of the school’s hundredth anniversary, honors alumni who have made contributions to society that emerged from their graduate study at Harvard. 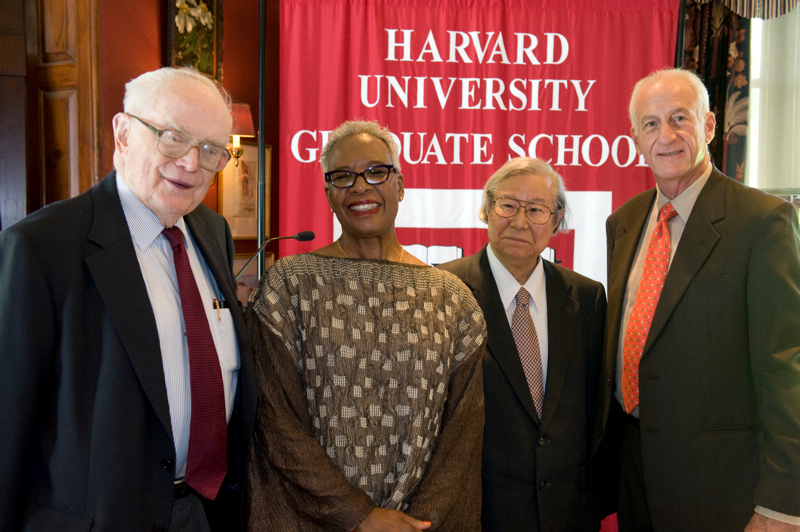 It is the highest honor the Graduate School bestows, and awardees include some of Harvard’s most accomplished alumni. Heisuke Hironaka is that rare scholar whose professional successes are made up almost equally of groundbreaking discoveries in his field and tangible work to bring the excitement of such discoveries to life for younger generations. A mathematician who trained under Harvard’s influential and discipline-shaping Oscar Zariski, Hironaka went on to become one of the leading algebraic geometers of his time. He rose to fame in 1964 for his work on the “resolution of singularities,” one of the most fundamental, and most difficult, problems in mathematics. Taking a “strikingly original approach,” as the American Mathematical Society later noted, Hironaka “created new algebraic tools and adapted existing ones” to solve this long-unsolvable problem. In recognition of that achievement, in 1970 he received the Fields Medal, often called the Nobel Prize of mathematics. After taking up appointments at Brandeis and Columbia, Hironaka returned to Harvard in 1968 to join the faculty of the Mathematics Department, where he currently holds the rank of Professor Emeritus. Beginning in 1975, he assumed a joint professorship at Kyoto University, and he later became director of the Research Institute for Mathematical Sciences in Kyoto. From 1996 to 2002, he was president of Yamaguchi University, returning to the prefecture where he was born. Hironaka is widely esteemed in his home country, to a degree that American mathematicians might both envy and find hard to believe. In 1970 he was elected to the Japan Academy, which recognizes the country’s most eminent researchers and scholars in the sciences, and in 1975 he was awarded Japan’s top cultural prize, the Order of Culture, by the Japanese government. The latter accolade turned him into a popular celebrity, a stature he has used to exert broad influence on Japanese society and education. Between 1977 and 1991, Hironaka wrote or co-authored 26 popular books on topics including discovery in science, the education of children and young adults, creative thinking, and mathematics. In 1980, he started a summer seminar for high school students, and later added one for Japanese and American college students, and he founded the Japanese Association of Mathematical Sciences to support those efforts as well as graduate study and research abroad by Japanese mathematicians. According to Shing-Tung Yau, the chair of Harvard’s Mathematics Department, Hironaka’s fundraising efforts on behalf of the association, which even included TV commercials, resulted in major support from corporations such as Mitsubishi and Fuji, and eventually the Japanese government. Beyond all that he has accomplished, there is the joy Hironaka takes in mathematics. He once told an interviewer of the pleasure he found in counting—in simply counting numbers and comparing them. And he has said that his attraction to the singularities problem had all the logic, and ultimately all the mystery, of “a boy falling in love with a girl.” It has been a happy union indeed. For answering the important questions in mathematics, for enabling countless scholars to pursue mathematical research at the highest levels, and for helping to spread the pure joys of mathematics to younger generations around the world, we honor you today. To say that Jeffrey Hoffman has traveled far since his days as a graduate student at Harvard would be a gross understatement. To be somewhat more exact, he has traveled more than 21.5 million miles, as an astronaut on five Space Shuttle missions. Along the way he rescued one of astronomy’s—and the world’s—most important assets and brought alive the excitement of space exploration to several generations of impatiently earthbound students. Today, Jeff Hoffman is not at all far away. In fact he is just down the river, at MIT, where he is Professor of the Practice of Aerospace Engineering in the Department of Aeronautics and Astronautics. But between 1978, when he was part of the first group of astronauts chosen for NASA’s new space shuttle program, and 1997, when he retired from the astronaut corps to become NASA’s European representative, he logged more than 1,200 hours in space. He made the first contingency spacewalk of the Space Shuttle era in 1985, attaching a “fly-swatter” device to the Shuttle’s robot arm in an attempt to rescue a wayward satellite. He flew a dedicated astronomy mission in December 1992, on board Columbia. He was the payload commander for the first flight of the Tethered Satellite System in July 1992, and he flew again for the Tethered Satellite relaunch in 1996. Now, with the Space Shuttle era set to end this summer, the chapter of US space history that Hoffman helped to write is also ending. It remains to be seen what the future of space exploration will hold, but it is almost certain that the students Hoffman has mentored, the skills he has taught—and the hardware he has gotten into space—will define that future, paving the way for our next great voyages of discovery. For helping to open our eyes to the wonders of space travel, for daring rescue missions that pushed the horizons of our knowledge of the universe, and for training younger generations to play leading roles in future voyages of discovery, we honor you today. When Richard Lyman arrived at Stanford as an associate professor of history in 1958, Stanford Magazine recalls, the pastoral setting and sleepy campus prompted a colleague to comment that anyone in search of intellectual excitement would have to travel 50 miles to Berkeley. By the time Lyman became Stanford’s Provost, in 1967, and President, in 1970, that tranquility was a thing of the past. He was confronted with some of the most contentious campus protests of a volatile era, as student activists rose up against the Vietnam War, military research activities, and University governance. The activism turned violent in 1968, when protesters burned the headquarters of the naval ROTC and vandalized the office of the outgoing University president. At a critical moment in 1969, when students had occupied Stanford’s Encina Hall, which housed sensitive student records, Lyman was forced to call in the police. As he recounts in his recent memoir, Stanford in Turmoil, one night rocks flew through the windows of his campus home, a room away from his sleeping daughter. Through it all, Lyman remained steady and strong, willing to make hard choices, confident in the conviction that Stanford must recover and prosper. And so it did. Derek Bok, Harvard’s president during those years, says Lyman’s good judgment was widely acknowledged beyond Stanford, too. “He was certainly held in great esteem by all his peers during his presidency of Stanford as one of the outstanding academic leaders of that period,” says Bok. Leadership, Lyman has written, “requires different qualities at differing times, and sometimes some of the qualities needed are not among those generally considered admirable.” And yet today, with full admiration, we salute you. For your courageous institutional leadership during a tumultuous time in US history, for your commitment to the core principles of higher education, and for expanding our understanding of how universities can connect scholars across disciplines for the benefit of society, we honor you today. As a historian, teacher, cultural critic, and now in a budding career as an artist, Nell Irvin Painter has approached the world around her with an uncommon empathy and a gift for bold strokes. Her instinct has been to value and connect the experiences of those historically undervalued actors in our American narrative: black people, native people, women, working people, and poor people. Her inclusivity—her commitment to the stories of everyday people—has been courageous, groundbreaking, and sometimes controversial. Most important, it has led to the creation of a new way of doing history—one that, through the students she has mentored, has imprinted itself on historical scholarship everywhere. Nell Irvin Painter is the Edwards Professor of American History, Emerita, at Princeton University, where she was the director of the Program in African American Studies from 1997 to 2000. Her prominence was recognized in her selection as president of the Southern Historical Association for 2007 and as president of the Organization of American Historians for 2007–08. Her books include Creating Black Americans (Oxford University Press, 2006) and Southern History Across the Color Line (University of North Carolina Press, 2002). Her newest book, The History of White People (W. W. Norton), was published in March 2010 and has just appeared in paperback. Before coming to Princeton, she was on the faculty at the University of Pennsylvania from 1974 until 1980 and at the University of North Carolina at Chapel Hill through 1988. Widely esteemed as a teacher and mentor, she has advised numerous dissertations and helped many other young scholars navigate the minefields of professional development. In 2000, the American Historical Association awarded her the Roelker Mentorship Award in recognition for this work. Now she is shaping a new legacy, starting over as a self-described “lowly graduate student” at the Rhode Island School of Design, where she will receive an MFA next month. Her decision to launch this new chapter—she earned a BFA degree in painting from Rutgers in 2009—manifests the same embrace of possibilities, and the same openness to risk and experimentation, that has defined her historical approach over the decades of her first career. We hope that this next chapter will be equally fulfilling. For writing history that values and connects the experiences of all Americans, for showing the influence of the marginalized on our national narrative, and for changing the practice of historical scholarship through your inspirational mentoring, we honor you today.